How much do hoverboards cost for popular models in 2019? Many people are interested in hoverboard cost, but aren’t sure how to choose the right one for them that is still a great price. This guide will help you find the right hoverboard for you by not only comparing the price of available options, but also making it simple for you to find the one that has the features that you need to really get the most use out of your new hoverboard. 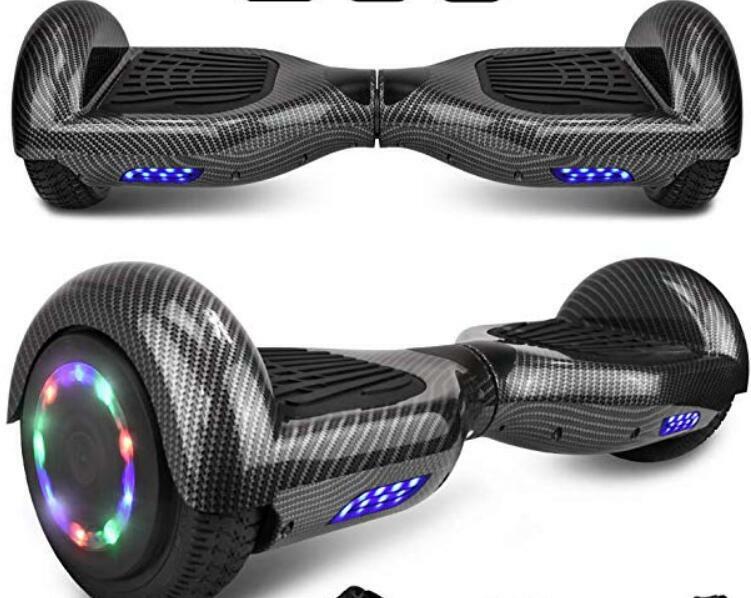 What is the Hoverboard Price Range? 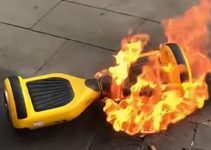 Why you must avoid cheap hoverboards? Who makes the best hoverboards? How much does it cost to repair a hoverboard? Just like with everything else, you get what you pay for when it comes to hoverboards. The newest and most feature-packed models in the market are a bit more expensive, whereas the ones with just the basic features will be more affordable. However, that does not mean that acquiring the most expensive models in the market is a wise choice for everyone. Sure, they are packed with features and technologies (including being water resistance, having a smartphone app integrated, Bluetooth speakers, LED lights, and much more) but they are not necessary for everyone. This is the lowest range for dependable hoverboards in the marketplace. 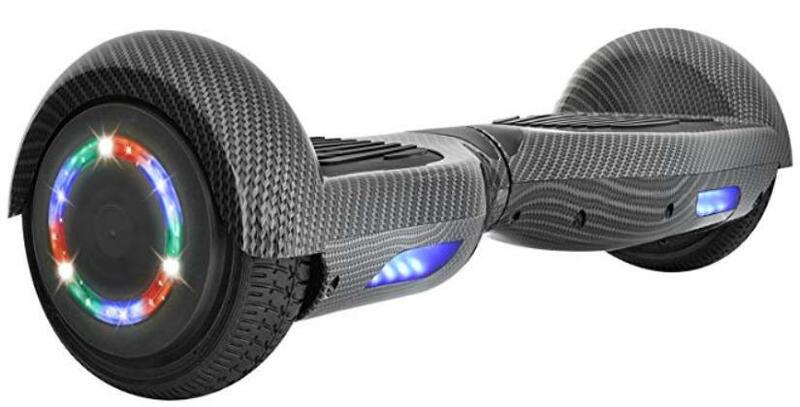 For $100 – $200, you can get yourself a reliable, but quite basic hoverboard. 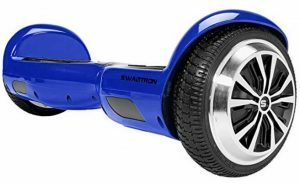 The gadgets in this price range are also great for both new and seasoned hoverboard rides, but the latter probably will not be enticed. After all, they are used to premium models and a basic one means they will have to sacrifice some of the most important features to them, including, longer traveling range, a higher speed, and maybe even a quicker charging time. For seasoned riders like me, this is what is usually regarded to as the “sweet spot” for hoverboards. In this price range, you will now encounter “almost-basic” hoverboards that have been packed with premium qualities and technologies such as a higher speed, Bluetooth speakers, off-road capabilities, LED lights, a longer warranty, and much more. Better yet, the build quality of gadgets in this range is also a bit better compared to the one you would find in devices in the $100 – $200 price range. 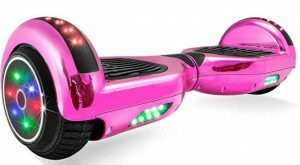 This, in turn, awards you a more durable and rugged hoverboard. The range and battery charging time also gets better at this level. If you’re an avid hoverboard rider who would like to acquire some of the best hoverboards in the marketplace, this is the price range that you should be looking at. If you’re wondering how this level differs from the second range we just touched on, I have a short answer for you; It gets you everything. All the extras you have ever heard of in the realm of hoverboards will be included in gadgets of this range. Astounding durability, the fastest riding speed, and the longest range are all features you should also expect to find in such hoverboards. There is an old story about a poor man and a rich man. They both needed a pair of boots. The poor man could afford the $10 per pair of shoes that could only last a year. The rich man, on the other hand, could afford the $30 per pair of shoes that had the potential to last up to five years. Because the rich guy spent more cash up front, he had less to spend on shoes in the long run. Things work the same way when it comes to hoverboards. If you buy the cheapest one in the market, expect it to break down in the near future, which will, in turn, require you to get a new one. If you buy a nicely priced one, however, you can expect it to last a long time if you take good care of it. Technology geeks and movie fans alike have both had a shared dream, and that is the chance to ride on a real hovering gadget just like the one Marty McFly rode in Back to the Future Part II. When the date we saw on the movie came to pass (October 21, 2015) the gadgets had two wheels that rolled on the floor, and worst yet, most of them had adopted the tendency to explode. This was undoubtedly not the future that any one of us had envisioned; so most of us thought the real hovering devices would never come to pass. But worry n more. The levitating skateboards are finally here. They may be nowhere close to becoming a common device like in the movie Back to the Future prophesized, but that does not mean that we will not get to that level. Without further ado, here are the best hoverboards in 2019. 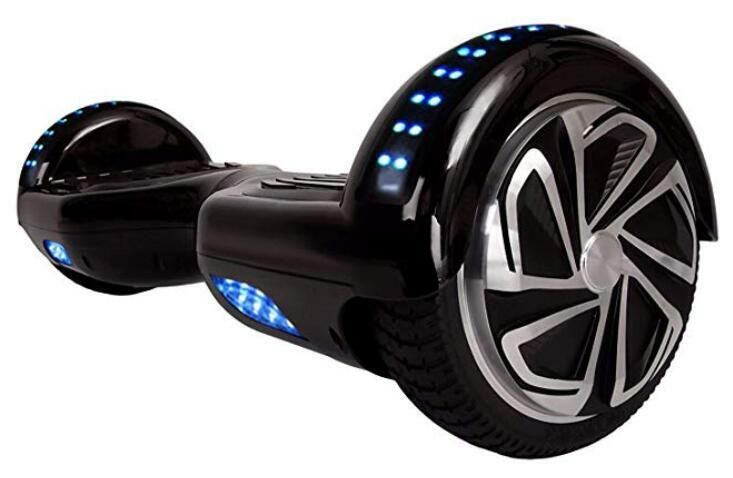 With this IO Hawk self-balancing hoverboard, you can finally cross to any limits. Thanks to the gadget’s 8.5-inch tire, you won’t be stopped by anything. May it be Gravel, Grass, or Sand? None of these will be a problem for the new IO Hawk cross. Even a curb is no longer a problem for IO Hawk who can encounter all bumps you come across with the large solid rubber tires and a sophisticated ride. This hoverboard costs $1,800. 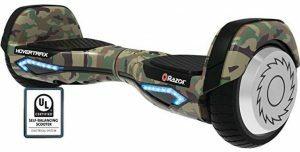 There is only one hoverboard make that could have Missy Elliot, John Legend, Cara Delavigne, Rajon Rondo, Jimmy Fallon, Jamie Foxx, Chris Brown, Kendall Jenner, and Justin Bieber as fans; i.e. PhunkeeDuck’s hoverboard. We can safely say it has already acquired the seal of approval. But the downside is, this hoverboard does not retail at an affordable price. 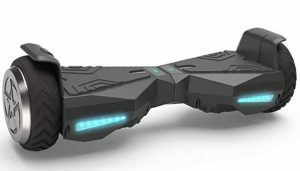 The PhunkeeDuck hoverboard goes at a whopping $1,499 and also retails with several different colors. The hoverboard can reach a top speed of approximately 12mph, can last 6 – 7 hours when fully charged, and has an astounding max load of 300 pounds. The device also retails with a one year warranty as well as a remote that you can use to lock and unlock your scooter. This hoverboard looks a lot like the IO Hawk hoverboard we just reviewed. It even resembles it down to the logo. That said, the designing company has pointed out that it boasts Chinese patents that other firms cannot use so the hoverboard is worth a try. You can get the Chic Robot Smart Scooter through Alibaba for about $500. This miniPro is specifically designed to perform nicely in ambient light surroundings. Whether you’re riding it during the Day or night, automatic LED taillights and headlights will light your way and ensure the cars ahead can also see you. The lights are also adjustable, in that you can adjust the headlights’ brightness up to five meters and also choose from more than 16 million different taillight color options. You can get this masterpiece at an affordable price of $315. The Zapata Flyboard Air is a predecessor to Frank Zapata’s original model and the second integration to the Flyboard series. Even though the original Flyboard propulsion system from the company used streams of high-pressure H2O drawn off from a small water body placed directly below the hoverboard, the state-of-the-art model has ditched the bulky hose and the entire system for an air based, and more versatile propulsion system. The Zapata Flyboard also recently set a new Guinness World Record for the “farthest hoverboard flight.” The device covered a distance of approximately 7,388 feet. This shattered the previous record that stood at 905 feet. The Hendo design utilizes disc-shaped magnetic hover engines situated at the bottom side of the board. These engines depend on the opposing magnetic fields found on a specialized surface below in order to provide the lift. The system does actually permit riders to hover off of the ground. Omni’s hoverboard design has taken a distinct route to give its passengers a ride in the air. Using its system of propellers to fly to the sky, the hoverboard can go way higher as opposed to hovering just a few inches above the ground. The manufacturing company also intends to have a consumer prototype ready by the end of 2019, so if I were you, I would keep my eye on the clouds for one of these masterpieces any time soon. Lexus, the carmaker also decided to take a stab at the technology and jump on this fast-moving bandwagon. It seems it has decided to flex its muscles beyond the vehicle’s world of luxury. From mid-2015, the firm posted several teasers that claimed it had finally created a ride-able, real life, hoverboard. The company piqued our interest with the footage that showed the hoverboard floating above a normal skate park. When the company unveiled the real product a couple of months later, they released a video of Ross McGouran, the pro skater shredding up a skate park that is situated in Barcelona. At this point, we all felt like the Back to the Future moment was not very far away. Speaking from an aesthetic point of view, the ArcaBoard obviously is not very impressive. The hoverboard is quite indistinguishable when compared to the run of the mill boxes. However, as the saying goes, looks alone can be deceiving. The ArcaBoard team responsible for this masterpiece spent hundreds, if not thousands of hours prototyping and creating different hoverboard structures, only to finally settle on a basic design that excelled in terms of security, stability, and durability. The design this equipment boasts (the shape of cutting edge aerodynamics and avionics) is a rectangular prism. It can be really difficult to find a high-quality hoverboard for sale for around $100, but this one from XtremePowerUS is currently available for just $149.95, which is part of the reason why it is so popular. It features a very powerful lithium-ion battery that is designed to charge in two to three hours and provide plenty of use. With a maximum speed of eight mpg and a rating for users 12+, this hoverboard offers the power that most people need to get used to how a hoverboard works without overspending. As long as the battery isn’t accidentally overcharged, this hoverboard will last for a long time and will continue to provide plenty of entertainment. If you are willing to pay a little more for your hoverboard, then you can opt for a slightly more powerful board that is a bit more enjoyable to ride and can travel up to 11 miles before needing to be recharged. With a price of $299, but currently on sale for $259.17, you can get a great hoverboard that is packed with upgrades. Not only is the battery leak proof and designed for lots of use, but this hoverboard has LED headlines, rubber bumpers, and battery indicators. The 250-W motor is a little lower than what other hoverboards have, but it does have enough power to help you get around town. It can be hard to find a compact and lighter hoverboard, but if you aren’t interested in a really heavy board, then this one is a great option. At only $159.99, it offers self balancing, as well as durable alloy metal components that are designed to withstand a lot of wear without breaking. Unlike other hoverboards on the market, this lightweight model will actually slow you down when the battery charge falls below 10% to help prevent the battery from draining completely and becoming ruined. This is a great feature, especially for people who are new to hoverboards and aren’t sure how to take care of their new equipment. There’s something really cool about being able to listen to music while you are on your hoverboard. 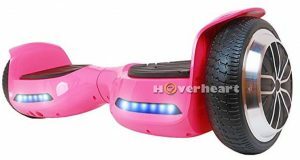 The bright pink skin of this hoverboard combined with the LED flashing light and Bluetooth speaker make this hoverboard a really neat one to ride. While it doesn’t have the most powerful motor, as it is a less expensive model, it’s perfect for younger riders or for people who are interested in just getting started riding a hoverboard. Thanks to the 6.5” wheels, this hoverboard can generally handle most any terrain, making it a great option for this lower hoverboard price of $173.99. Currently listed at $199.99, a savings of $50, this hoverboard is packed with some really neat features. Enjoy a map function, being able to play music, the ability to check batteries, and quickly change modes via the powerful and easy to use app. 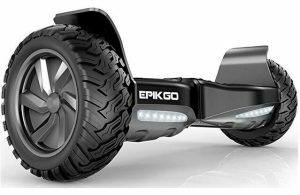 The battery fully charges in under two hours, allowing users the ability to travel at speeds up to 7.5 mph and to climb 30 degree inclines without any problems. Additionally, unlike some boards that have lower weight limits, this board can easily handle riders that weigh between 44 and 220 pounds. Thanks to the self-balancing feature, it’s easy to learn how to ride on this hoverboard. While this hoverboard is much more expensive than some other models that you can buy, at $350, it is very safe, easy to use, and offers plenty of power, making it a great option for users who want a little bit more out of their hoverboards. Unlike prior models of this hoverboard and ones released by other companies, the Hovertrax 2.0 can easily and quickly climb inclines of more than 30 degrees without the rider being at risk. Additionally, it starts self balancing as soon as a rider steps on the hoverboard. The wheels are durable and designed to offer you the ability to travel even on rough terrain without any problems. With 400W dual motors, a 10-mile range on just one charge, and the certification of 159 safety tests, you can ride this hoverboard easily and with peace of mind. The tires are made of solid rubber and will allow you to easily go off the road through sand, grass, and mud without problems. Since this hoverboard is 30% larger than other boards on the market, it’s easy for a user to spread out their feet, enjoying more control and a more stable ride. At $599.99, you will love the one-year limited warranty, as well as the fact that this hoverboard is semi-submersible and waterproof certified. At $135, this hoverboard is a great budget option for people who don’t have a lot to spend on a new hoverboard, but who are still looking for a hoverboard that has a few additional features. This hoverboard includes a stereo speaker that will allow you to easily connect to any Bluetooth enabled electronics so that you can take your music with you on the go. Additionally, while the charge time is a little longer at three to five hours, it’s easy to recalibrate the hoverboard if you have problems with a smooth ride and to get started riding for the first time. While this hoverboard only reaches speeds of up to six mph for 7.5 miles, it offers a number of other benefits that make it very attractive to buyers. It’s not only Bluetooth enabled and certified, but this hoverboard has futuristic LED lighting all around the board, making riding in the dark incredibly fun and a lot safer. The strong shell is designed to withstand plenty of falls and accidents without being damaged, so you don’t need to worry about accidentally breaking your new hoverboard. At just $148, it’s a great option for buyers on a budget who still want a high-quality board. All terrain hoverboards provide riders with a lot more power and control, especially when they want to go off the beaten path. 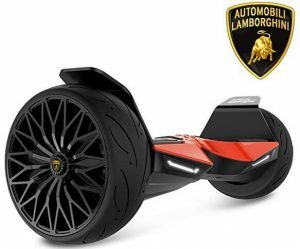 The 8.5” tires on this hoverboard, the 400W motor, and fast charging time make this hoverboard from Lamborghini worth $369. 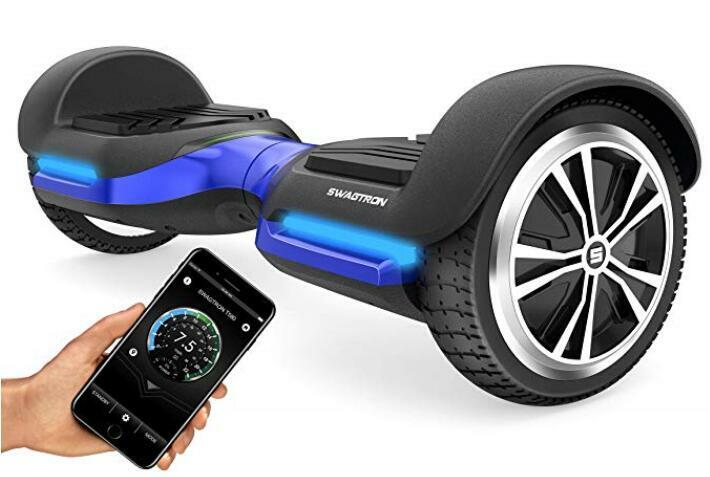 Not only is this hoverboard self balancing, making it easy to ride, but it has Bluetooth speakers that are built-in, powerful LEDs to light up your way, and intelligent ride sensors to make riding this board incredibly easy for anyone to do. Perfect for people up to 264 lbs, you can travel 9.32 miles on a full charge. Additionally, the 36V li-ion power battery offers you all of the power that you need for playing loud music and enjoying incredible lights when riding. Choose from new hoverboard skins that are designed to be fire resistant and enjoy front LED lights, support up to 180 lbs, and great speed control when you buy this $125 hoverboard. It has safety certifications to help you rest easy knowing that you will be safe when riding, and allows riders to hit a maximum speed of 10 mph. 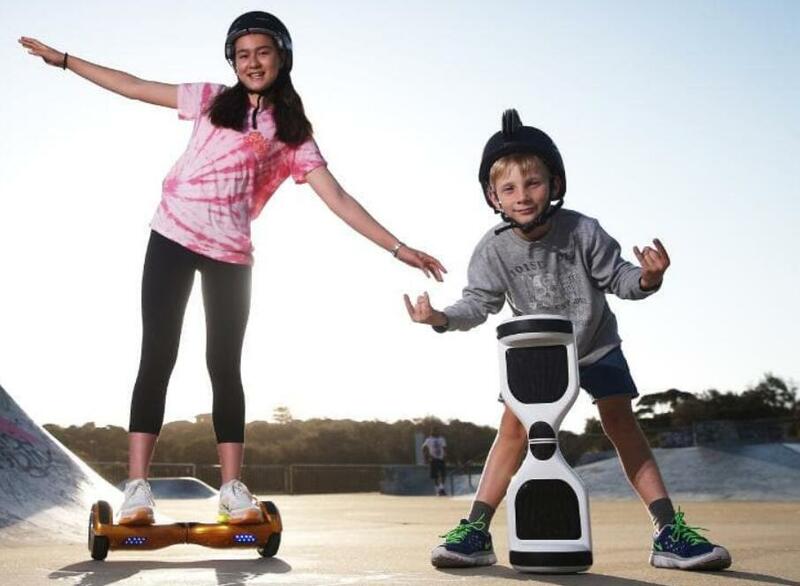 Thanks to the self-balancing feature, this hoverboard is easy to learn how to ride, and most riders will be able to travel between six and eight miles, depending on both the condition of the road and the weight of the rider. It’s a great choice for beginners or for kids, as the 6.5” wheels are standard and will provide plenty of support. If your hoverboard is still under warranty, it should get fixed for free if something protected by the warranty happens. However, if it is already past the warrant or what happened is not covered by the warranty, below is an enumeration of the amount you should expect to pay for different repairs. Buying a hoverboard will allow you a really fun way to get around town, but you have to make sure that you choose one that is in your price range. As you can see, hoverboards can vary widely in price, making it important that you consider not only your budget that you have to work with, but also what type of features you are interested in. By taking into consideration the size of the motor and the wheels, if there are lights or Bluetooth features, and how quickly the hoverboard charges, you can find one that will offer you the speed and ability to go the distance that you want.